It is a largely unchallenged claim of anthropologists that the human race emerged from the continent of Africa. However, claims relating to our evolution before our nomadic ancestors left the land of our origin have been left largely abstruse. A new paper published on PNAS.org this week attempts to address this very problem through genetic analysis of several hunter gatherer societies in Africa including speakers of the nearly distinct N|u language. This was done because hunter-gather populations remain divergent in their variations at a level which is no longer maintained in the African population as a whole. 580,000 Single-nucleotide polymorphisms (SNPs) were analysed to calculate genetic relationships and diversity between the groups and propose possible evolutionary paths and branches. Henn et al. (2011) propose that the genetics of those groups found in the south of Africa are the most diverse, and therefore the oldest, of any diversity found among other modern humans. This has caused them to suggest that the origins of modern humans may in fact be in southern Africa as opposed to the much more accepted view which is that we emerged from the east of Africa. This assumed eastern viewpoint is a result of the earliest modern human skulls being found in the east and also the fact that humans in the rest of the world all carry a subset of genes found specifically in eastern Africa. However, until now, the populations represented in the study by Henn et al. (2011) have not been represented in previous genetic studies when making estimates of the whereabouts of our evolutionary origins. Some dispute has arisen regarding these conclusions because the current whereabouts of these hunter-gatherer populations within Africa is not evidence to suggest that this is always where these populations have resided. These groups may have moved about and migrated from their original place of origin just as the rest of humanity has. Henn has retorted that, though this is a possibility, typically only a subset of a group moves to a new area, and this subset is less genetically diverse than the parent population. This would mean that if a group of humans left eastern African for southern Africa they would be expected to be less diverse in the population who moved and this contradicts the genetic data found in Henn et al. (2011). Much of the success of our species rests on our ability to learn from others’ actions. From the simplest preverbal communication to the most complex adult expertise, a remarkable proportion of our abilities are learned by imitating those around us. Imitation is a critical part of what makes us cognitively human and generally constitutes a significant advantage over our primate relatives (Lyons et al. 2007: 19751). Indeed, there have been some interesting experiments suggesting that the human capacity -and, above all, motivation – for imitation is an important characteristic that separates us from the other great apes. In a series of intriguing experiments by Victoria Horner and Andrew Whiten from the University of St. Andrews in Scotland, and Derek Lyons and his colleagues from Yale University, young wild-born chimpanzees and Children aged 3 to 4 were shown how to get a little toy turtle/ a reward out of a puzzle box. 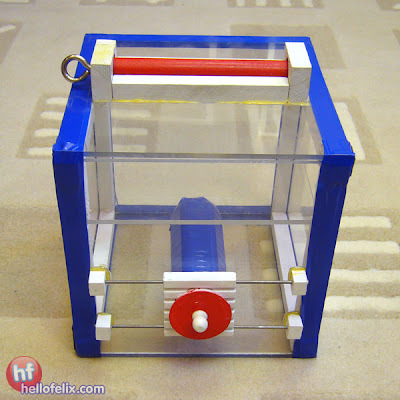 In the first condition of the experiment the puzzle box was transparent, whereas in the second condition the puzzle box was opaque. 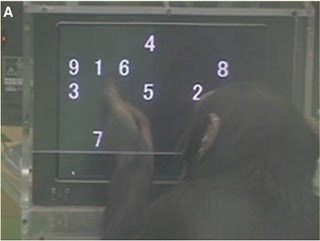 And here’s the catch: both chimpanzees and children were not shown the ‘right’ or ‘simple’ solution to how to get the reward but one that was actually more complicated and involved unnecessary steps. In my last post I summed up some proposals for what (among other things) makes human cognition unique. But one thing that we should bear in mind, I think, is that our cognitive style may more be something of an idiosyncrasy due to a highly specific cognitive specialization instead of a definitive quantitative and qualitative advance over other styles of animal cognition. In this post I will look at studies which further point in that direction. Chimpanzees, for example, beat humans at certain memory tasks (Inoue & Matsuzawa 2007) and behave more rational in reward situations (Jensen et al. 2007). In addition, it has been shown that in tasks in the social domain, which are generally assumed to be cognitively complex, domesticated animals such as dogs and goats (Kaminski et al. 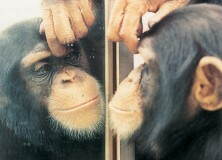 2005) fare similarly well or even outperform chimpanzees. 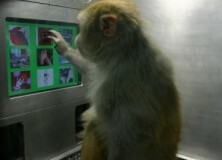 It is entirely possible that the first signs of human uniqueness where at first simply side-effects our self-domesticating lifestyle – the same way the evolution of social intelligence in dogs and goats is hypothesised to have come about –, acting on a complex primate brain (Hare & Tomasello 2005). What seems most interesting to me, however, is another by-product of their experimental domestication: they also improved in the domain of social cognition. 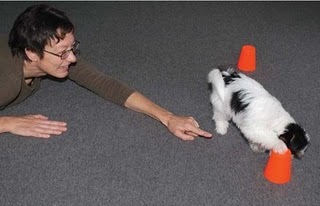 For example, like dogs, they are able to understand human communicative gestures like pointing. This is all the more striking because, as mentioned above, chimpanzees do not understand human communicative gestures like helpful pointing. 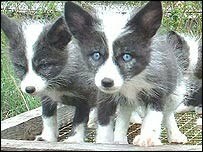 Neither do wolves or non-domesticated silver foxes (Hare et al. 2005). In this post, I’ll focus on six candidates that might play a part in constituting what makes human cognition unique, though there are countless others (see, for example, here). “saying that only humans have language is like saying that only humans build skyscrapers, when the fact is that only humans (among primates) build freestanding shelters at all” (Tomasello et al. 2005: 690). 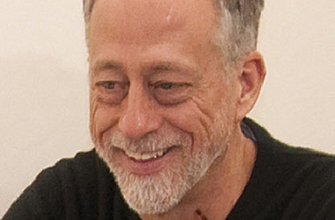 According to Tomasello and many other researchers, language and symbolic behaviour, although they certainly are crucial features of human cognition, are derived from human beings’ unique capacities in the social domain. As Willard van Orman Quine pointed out, language is essential a “social art” (Quine 1960: ix). Specifically, it builds on the foundations of infants’ capacities for joint attention, intention-reading, and cultural learning (Tomasello 2003: 58). 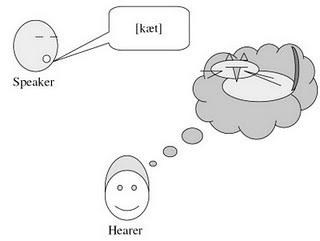 Linguistic communication, on this view, is essentially a form of joint action rooted in common ground between speaker and hearer (Clark 1996: 3 & 12), in which they make “mutually manifest” relevant changes in their cognitive environment (Sperber & Wilson 1995). This is the precondition for the establishment and (co-)construction of symbolic spaces of meaning and shared perspectives (Graumann 2002, Verhagen 2007: 53f.). These abilities, then, had to evolve prior to language, however great language’s effect on cognition may be in general (Carruthers 2002), and if we look for the origins and defining features of human uniqueness we should probably look in the social domain first. Corroborating evidence for this view comes from comparisons of brain size among primates. 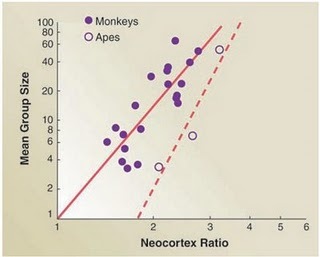 Firstly, there are significant positive correlations between group size and primate neocortex size (Dunbar & Shultz 2007). Secondly, there is also a positive correlation between technological innovation and tool use – which are both facilitated by social learning – on the one hand and brain size on the other (Reader and Laland 2002). Our brain, it seems, is essential a “social brain” that evolved to cope with the affordances of a primate social world that frequently got more complex (Dunbar & Shultz 2007, Lewin 2005: 220f.). 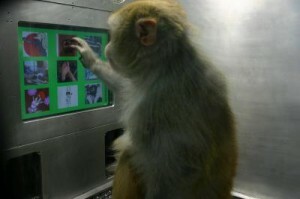 Thus, “although innovation, tool use, and technological invention may have played a crucial role in the evolution of ape and human brains, these skills were probably built upon mental computations that had their origins and foundations in social interactions” (Cheney & Seyfarth 2007: 283). Hello! This is my first post here at Replicated Typo and I thought I’d start with reposting a slightly modified version of a three-part series on the evolution of the human mind that I did last year over at my blog Shared Symbolic Storage. So in this and my next posts I will have a look at how human cognition evolved from the perspective of cognitive science, especially ‘evolutionary linguistics,’ comparative psychology and developmental psychology. In this post I’ll focus on the evolution of the human brain. In our lineage, we share a common ancestor with orangutans (about 15 million years ago (mya)), gorillas (about 10mya), and most recently, chimpanzees and bonobos (5 to 7 mya). We not only share a significant amount of DNA with our primate cousins, but also major anatomical features (Gazzaniga 2008: 51f., Lewin 2005: 61) These include, for example, our basic skeletal anatomy, our facial muscles, or our fingernails (Lewin 2005: 218ff.). 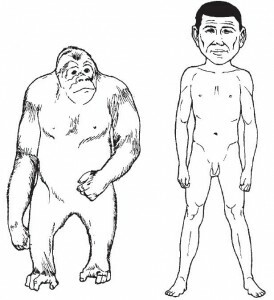 What most distinguishes us as humans on an anatomical level are our bizarre hair distribution, our upright posture and the skeletal modifications necessary for it, including a propensity for endurance running, our opposable thumbs, fat deposits that are unusually extensive (Preuss 2004: 5), and an intestinal tract only 60% the size expected of primates our size (Gibbons 2007: 1558). Finally, there is also a distinguishing feature that is a much more remarkable violation of expectations – a brain three times the size expected of a primate our size. This is all the more interesting as primates are already twice as encephalized as other mammals (Lewin 2005: 217). 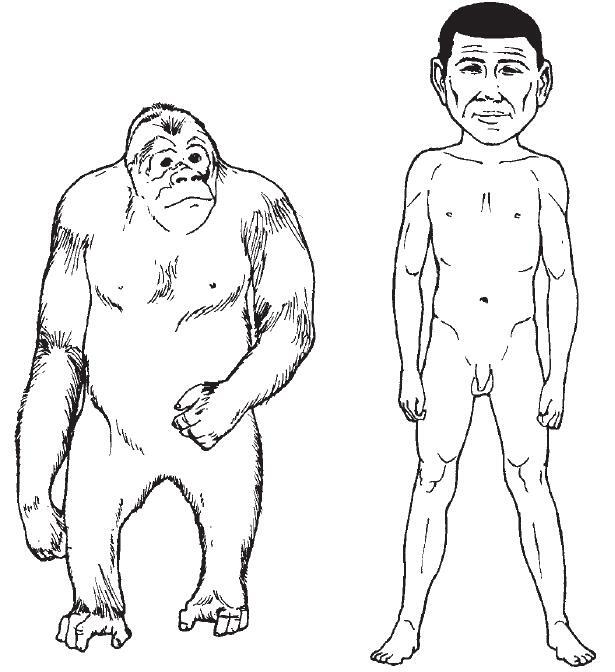 A direct comparison shows this difference in numbers: Whereas human brains have an average volume of 1251.8 cubic centimetres and weigh about 1300 gram, the brains of the other great apes only have an average volume of 316.7 cubic centimetres and weigh between 350-500 gram (Rilling 2006: 66, Preuss 2004: 8). In a human brain, there are approximately a hundred billion neurons, each of which is connected to about one thousand other neurons, comprising about one hundred trillion synaptic connections (Gazzaniga 2008: 291). If you would count all the connections in the napkin-sized cortex alone, you’d only be finished after 32 million years (Edelman 1992: 17). The human brain is also extremely “expensive tissue” (Aiello & Wheeler 1995): Although it only accounts for 2% of an adult’s body weight, it accounts for 20-25% of an adult’s resting oxygen and energy intake (Attwell & Laughlin 2001: 1143). In early life, the brain even makes up for up 60-70% of the body’s total energy requirements. A chimpanzee’s brain, in comparison, only consumes about 8-9% of its resting metabolism (Aiello & Wells 2002: 330). The human brain’s energy demands are about 8 to 10 times higher than those of skeletal muscles (Dunbar & Shultz 2007: 1344), and, in terms of energy consumption, it is equal to the rate of energy consumed by leg muscles of a marathon runner when running (Attwell & Laughlin 2001: 1143). All in all, its consumption rate is only topped by the energy intake of the heart (Dunbar & Shultz 2007: 1344). “because the cost of maintaining a large brain is so great, it is intrinsically unlikely that large brains will evolve merely because they can. Large brains will evolve only when the selection factor in their favour is sufficient to overcome the steep cost gradient“ (Dunbar 1998: 179). This is especially important for people who want to come up with an “adaptive story” of how our brain got so big: they have to come up with a strong enough selection pressure operative in the Pleistocene “environment of evolutionary adaptedness” that would have allowed such “expensive tissue” to evolve in the first place (Bickerton 2009: 165f.). What About the Brain is Uniquely Human? If we look to the brain for possible hints, we first find that presently, there is “no good evidence that humans do, in fact, possess uniquely human cortical areas” (although the jury is still out) (Preuss 2004: 9). 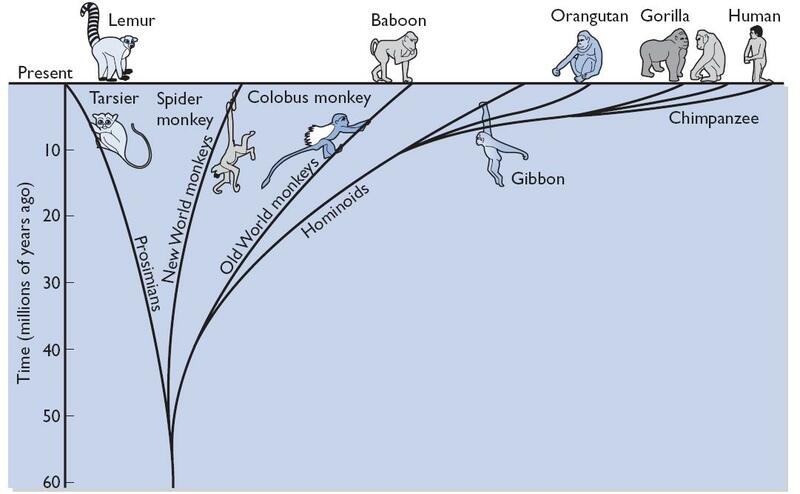 In addition, we find that there are functions specific to humans which are represented in areas homologous to areas of other primates. Instead, it seems that in the course of human evolution some of the areas of the brain expanded disproportionally, “especially higher-order cortical areas, including the prefrontal cortex” (Preuss 2004: 9, Deacon 1998: 435-438). This means that humans are not simply ‘better’ at thinking than other animals, but that they think differently (Preuss 2004: 7). The expansion and apparent specializations of only certain kinds of neuronal areas could indicate a qualitative shift in neuronal activity brought about by re-organization of existing features, leading to a wholly different style of cognition (Deacon 1998: 435-438 Rilling 2006: 75). This scenario squares well with what we know about the way evolution works, namely that it always has to work with the raw materials that are available, and constantly co-opts and tinkers with existing structures, at times producing haphazard, cobbled-together, but functional results (Gould & Lewontin 1979, Gould & Vrba 1982). 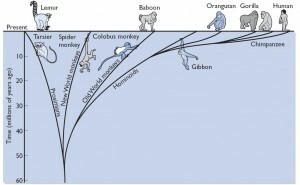 Given the relatively short time span for the evolution of the “most complex structure in the know universe”, as it is sometimes referred to, we have to acknowledge how preciously little time the evolutionary process had for ‘debugging.’ It could well be that make the human mind is so unique because it is an imperfect ‘Kluge:’ “a clumsy or inelegant – yet surprisingly effective – solution to a problem,” like the Apollo 13 CO2 filter or an on-the-spot invention by MacGyver (Marcus 2008: 3f.). It may thus well turn out that what we think makes us so special is a mental “oddity of our species’ way of understanding” the world around us (Povinelli & Vonk 2003: 160). It is reasonable then to assume that human cognition did not just simply get better across the board, but that instead we owe our unique style of thinking to quite specific specializations of the human mind. With this in mind, we can now ask the question how these neurological differences must translate into psychological differences. But this is where the problem starts: Which features really distinguish us as humans and which are more derivative than others? A true candidate for what got uniquely human cognition off the ground has to pass this test and solve the problem how such “expensive tissue” could evolve in the first place. In my next post I will have a look at six candidates for what makes human cognition unique. Attwell, David and Simon B. Laughlin. (2001.) “An Energy Budget for Signaling in the Grey Matter of the Brain.” Journal of Cerebral Blood Flow and Metabolism 21:1133–1145. Bickerton, Derek (2009): Adams Tongue: How Humans Made Language. How Language Made Humans. New York: Hill and Wang. Deacon, Terrence William (1997). The Symbolic Species. 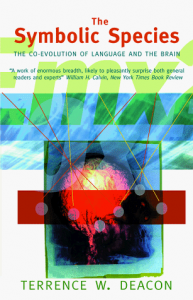 The Co-evolution of Language and the Brain. New York / London: W.W. Norton. Dunbar, Robin I.M. (1998): “The Social Brain Hypothesis Evolutionary Anthropology 6: 178-190. Gazzaniga, Michael S. (2008): Human: The Science of What Makes us Unique. New York: Harper-Collins. Gibbons, Ann. (2007) “Food for Thought.” Science 316: 1558-1560. Gould, Stephen Jay and Richard Lewontin (1979): “The spandrels of San Marco and the Panglossian paradigm: a critique of the adaptationist programme.” Proclamations of the Royal. Society of London B: Biological Sciences 205 (1161): 581–98. Gould, Stephen Jay, and Elizabeth S. Vrba (1982), “Exaptation — a missing term in the science of form.” Paleobiology 8 (1): 4–15. Lewin, Roger (2005): Human Evolution: An Illustrated Introduction. Oxford: Blackwell. Marcus, Gary (2008): Kluge: The Haphazard Evolution of the Human Mind. London: Faber and Faber. Povinelli, Daniel J. and Jennifer Vonk (2003): “Chimpanzee minds: Suspiciously human?” Trends in Cognitive Sciences, 7.4, 157–160. Preuss Todd M. (2004): What is it like to be a human? In: Gazzaniga MS, editor. The Cognitive Neurosciences III, Third Edition. Cambridge, MA: MIT Press: 5-22. Here is a far-reaching and crucially relevant question for those of us seeking to understand the evolution of culture: Is there any relationship between population size and tool kit diversity or complexity? This question is important because, if met with an affirmative answer, then the emergence of modern human culture may be explained by changes in population size, rather than a species-wide cognitive explosion. Some attempts at an answer have led to models which make certain predictions about what we expect to see when populations vary. For instance, Shennan (2001) argues that in smaller populations, the number of people adopting a particular cultural variant is more likely to be affected by sampling variation. So in larger populations, learners potentially have access to a greater number of experts, which means adaptive variants are less likely to be lost by chance (Henrich, 2004). Models aside, and existing empirical evidence is limited with the results being mixed. I previously mentioned the gradual loss of complexity in Tasmanian tool kits after the population was isolated from mainland Australia. Elsewhere, Golden (2006) highlighted the case of isolated Polar Inuit, who lost kayaks, the bow and arrow and other technologies when their knowledgeable experts were wiped out during a plague.Yet two systematic studies (Collard et al., 2005; Read, 2008) of the Inuit case found no evidence for population size being a predictor of technological complexity. For those of you familiar with the formal mathematical models of cultural evolution (Cavalli-Sforza & Feldman, 1981; Boyd & Richerson, 1985), you’ll know there is a substantive body of literature behind the process of cultural transmission. It comes as a surprise, then, that experiments in this area are generally lacking. For instance, if we look at evolutionary biology, then there are many experiments into small-scale microevolutionary processes, such as natural selection, sexual selection, mutation and drift, which are then applied in showing how these processes generate population-level, macroevolutionary patterns. It follows then, that this sort of population-level thinking can be applied to cultural evolution: the forces and biases of cultural transmission can be studied experimentally to see if they fit with population-level patterns of cultural change documented by scientists. As the current paper by Mesoudi & Whiten (2008) notes, this potentially gives cultural transmission experiments added significance: “cultural transmission should not only be studied for its own sake (i.e. in order to better understand cultural transmission itself), but also in order to explain broader cultural patterns and trends, all as part of a unified science of cultural evolution”.